[Click here for Part 1.] Following the lunch break, a plenary session featured political theorist Michael Walzer in conversation with sociologist Todd Gitlin, largely centering on how they relate to Israel. 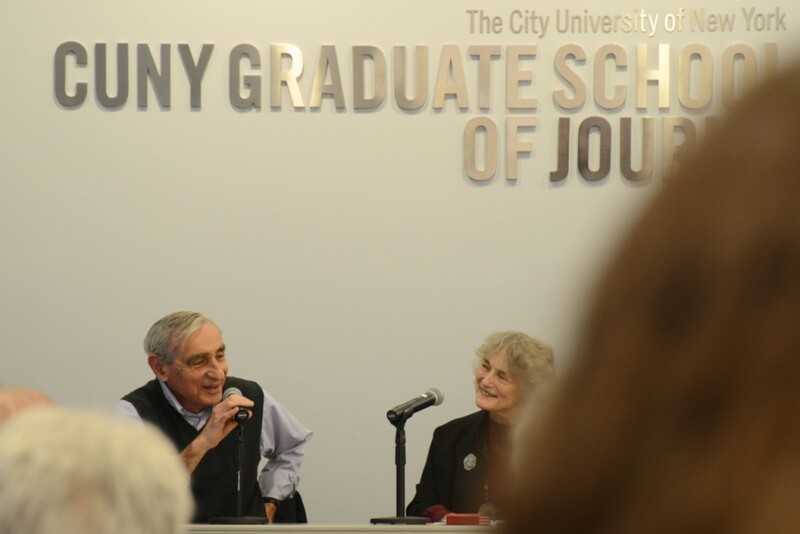 Although their positions on the issues are close, Prof. Walzer (pictured with moderator Prof. Alice Kessler-Harris [photo by Gili Getz]) identifies himself as a Zionist, while Prof. Gitlin does not. In somewhat different ways, both indicated a two-front struggle. Walzer resists efforts to delegitimize Israel and simultaneously argues against those in the Jewish community who support occupation. Gitlin stated that he would debate supporters of BDS, but also work with them where he can to oppose the occupation. Late in the afternoon, the assemblage broke into three separate breakout sessions. The most popular in terms of attendance was on “The Campus Environment,” with these panelists: J Street U president Amna Farooqi, ‘If Not Now, When’ founder and activist Simone Zimmerman, and visiting scholar Shahar Sadeh; and moderated by Kenneth Stern, the executive director of the Justus & Karin Rosenberg Foundation. Another entitled “Progressive Initiatives on the Ground for Israeli-Palestinian Peace and Reconciliation,” featured Sulaiman Khatib, the Palestinian co-director of Combatants for Peace (whom I’ve had the pleasure of meeting recently), along with Dr. Shemsi Prinzivalli, president of the Alliance for Middle East Peace, and Geoffrey H. Lewis, board member of Americans for A Vibrant Palestinian Economy, and was moderated by Ameinu board member and TTN co-founder Dan Fleshler. I attended “Israel and Palestine in the Media,” featuring The Nation magazine’s media columnist and CUNY professor Eric Alterman and Chloe Sobel, the editor in chief of New Voices Magazine (a venue for Jewish students), and moderated by Debra Nussbaum Cohen, currently the New York correspondent for Haaretz. Since the panel was “off the record,” all I can say is that I was fascinated to hear about the challenges faced by these liberal journalists struggling to be fair in picturing Israel and the Palestinians in today’s hyper-polarized media environment. 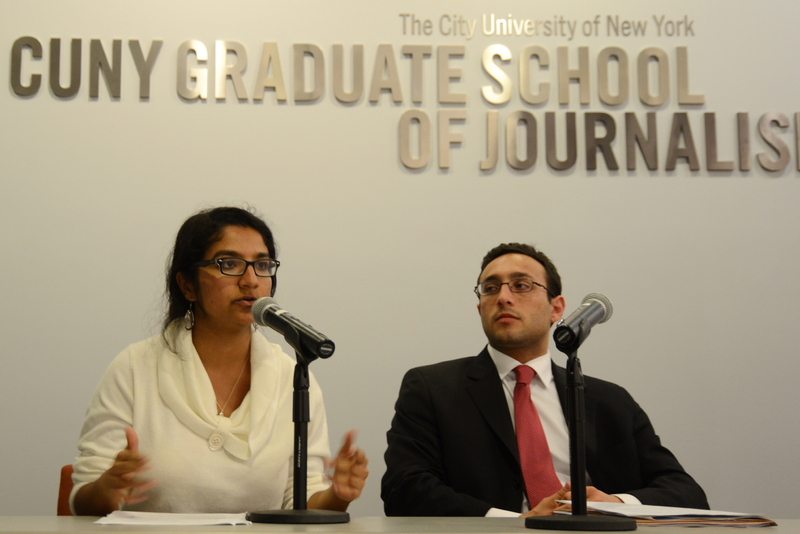 Amna Farooqi speaking in the closing session, alongside TTN organizer Josh Schwartz; photo courtesy of Gili Getz. Israel will never be safe and secure until there’s a two-state solution and an end to occupation. She criticized the one-sided attitude exemplified by Bret Stephens in a recent Wall Street Journal op-ed blaming the current violence entirely on pathological hatred of Jews, and not the occupation. BDS has successes because it gives people a clear choice, albeit a “false dichotomy”: are you pro- or anti-occupation? The Green Line does not exist for most of the American Jewish establishment. J Street U has been investigating the funding allocations of Jewish community federations, working for “transparency.” Many Jewish federations don’t contribute funds beyond the Green Line, but keep this quiet (others make such contributions). She commended New York’s UJA-Federation for its transparency, but indicated that the Los Angeles federation is not open about its allocations. The event concluded as it had begun, with remarks by Ameinu’s CEO Gideon Aronoff.